Get $30 off $100+ orders with code "DISCOVER30A". This deal is exactly the same as the AMEXSPRING offer we discussed earlier and this time orders really do need to be $100 to trigger the $30 discount. And like the AmEx deal, this one is quirky compared to other AmEx Sync/Discover Deals offers. This is good news and bad news. It's good news because although the terms state you have to use your Discover card to check out that doesn't seem to be enforced. It's bad news in that these savings aren't doubled as part of this amazing promotion Discover is running. You may want to wait, however, as signup bonuses go up and down all the time. I got my Discover card last year for a $150 signup bonus. 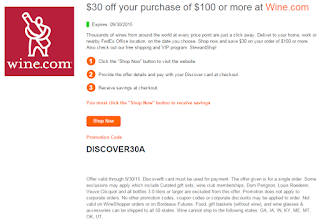 This can be a nice way to get slightly less than 30% off at Wine.com. You have to choose wines with low markups relative to street price, and you have to finagle free shipping (and remember to cancel it before it auto-renews) to maximize savings. More details on the finer points of this deal here. It's not necessarily a huge deal, since you can repeatedly use the AMEXSPRING offer by registering with multiple email addresses. 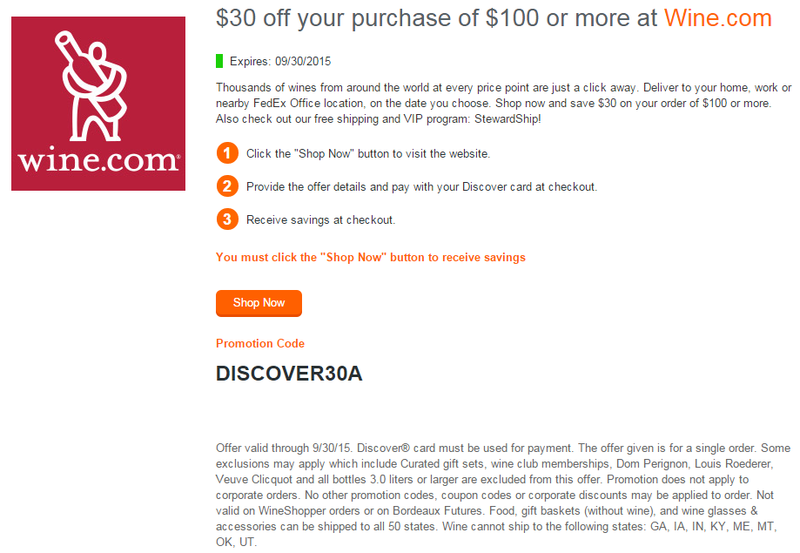 But this new DISCOVER30A code can be used for the same Wine.com in addition to the AMEXSPRING, enabling you to get $30 off $100 twice for the same Wine.com account. I'd love it if you subscribed to the WWP for future updates.